MAKERERE – At a colorful ceremony held on this week, the Directorate of Research and Graduate Training (DRGT) recognized Mr. Allan Kizza as the Employee of the year 2018. Professor Buyinza Mukadasi, the Director, DRGT, at Makerere told PML Daily that Mr. Kizza demonstrated valuable contribution, exemplary work performance, hard-work and dedicated service as Records Officer. He explained that it is a tradition at DRGT, to recognize those employees who have made significant contributions to the vision, mission and strategic imperatives of DRGT. 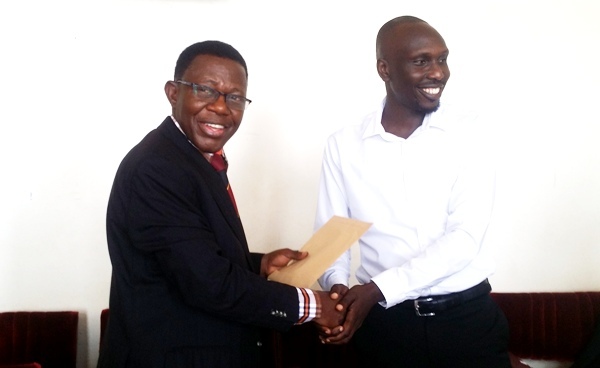 Mr. Dickens Piriyo, from the Examination Office, emerged as the Runner-Up and was given a Cash token of UGX500,000. Award benefits for the best employee included Sh1,000,000, an engraved plaque, bouquet of flowers and songs of Praise and Worship.